This whole month I am doing nail art for @clairestelle8challenge so for the theme WIZARD I did my very first Harry Potter Nails. I asked my daughters(Harry Potter Fans !!) 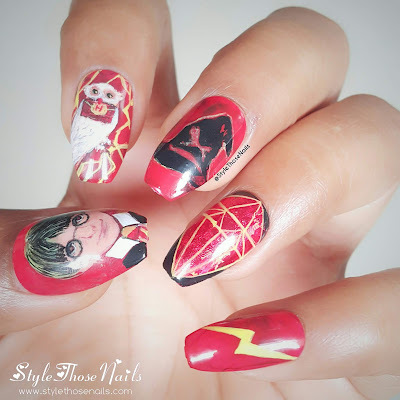 what I should paint for wizard theme and they unanimously voted for Harry Potter LOL ……. 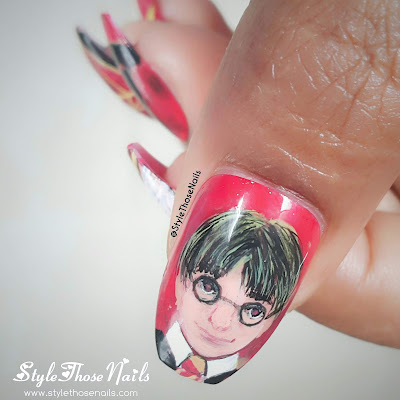 Ironically neither I have watched nor read any Harry Potter though it is in my to do list for looooong so I sat with my kids and watched my first Harry Potter movie. 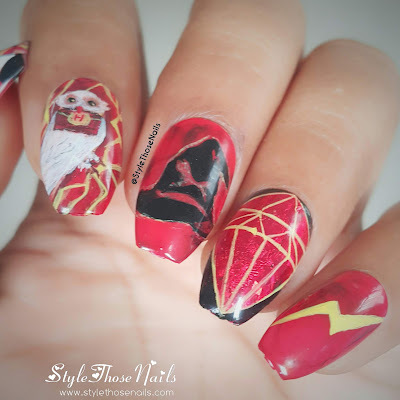 "The Philosopher Stone" no doubt I loved it and I am on to watch all others too :D So if you have watched it you can easily identify all the characters - Thumb has Harry itself (I know I am not good at portraits but I tried my best :P) index has Hedwig, middle nail has Sorting Hat while on ring finger I made Philosopher Stone. Lastly pinky has the famous lightening bolt. Omg, they look adorable. I love your thumb design. This mani is so awesome and detailed! Im not a potter fan, but these are amazing! !